Ehud Olmert has a fatal flaw. Fatal for Israel mostly. Give him a position of power and he exploits it to enrich himself, and damn the consequences for the country. When he was Jerusalem's mayor, he pillaged the city treasury for himself and his cronies. On five separate occasions he was investigated by the State Comptroller for theft and corruption. Shall we begin with a quick overview? Only two years went by, and in the race against Sharon it emerged that Olmert had not learned his lesson. The investigation of his relations with contractor David Appel found that his office manager, Shula Zaken, had phoned Appel, asked him for a contribution to Olmert's election campaign, and arranged the visit by the mayor of Athens, suiting it to his needs. Olmert joined the conversation on an extension and said to Appel, "Whatever you want, just tell me," but Attorney General Menachem Mazuz realized that Zaken had implicated Olmert through no fault of his own - "Yes, Mr. Mayor" - and closed the case. In the affair of the Likud receipts, Mudrik mentioned with skepticism one of the witnesses' problems with his memory, which conveniently became confused. At that time, the judge did not remember that forgetting is a common human phenomenon. Olmert remembered hardly anything in the Appel case - not the Greek delegation, not the special help that Appel had requested, and not even whether such help had been received. This was the second incident that caused Olmert an attack of amnesia. The first was recorded in 1988, in criminal case 84/87 against Yehoshua Halperin of the Bank of North America. Olmert, the witness for the prosecution, had borrowed $50,000 from Halperin interest-free, but found at least 12 different ways to say that he could not remember. With his recent newfound power, Olmert was quick to turn it to his advantage. First, he compromised Israel's telecommunications industry. Partner is one of the country's three cellular companies. Its clients include the military, police...in fact, the whole security apparatus. Because of the fear of a hostile takeover, nobody may purchase more than 10% of a cellular company's stocks without interference by the government. In mid-December, Olmert flew to Hong Kong and met with the CEO of Hutchison Telecommunications International, the majority shareholder in Partner. Just a week later, an Egyptian company, Orascom, bought 19.85% of Hutchison's shares which just happened to give it a 9.997% of Partner's stocks. Olmert had coached well. Now one of Israel's most important telecommunications companies had a new Egyptian partner, one with stakes in companies in Algeria, Iraq, Pakistan and Bangladesh, Israel's dearest friends. 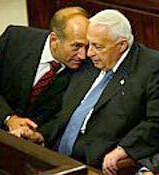 As for Olmert; did someone say kickbacks? Policy u-turn: Olmert wants to buy gas from Britain, not only Egypt 19.1.06 | 18:16 By Sharon Kedmi In an abrupt about-face of policy, acting prime minister and finance minister Ehud Olmert is seeking to buy natural gas from Britain. The gas would derive from an offshore field British Gas has developed in partnership with the Palestinians: the Prime Minister's Office under Ariel Sharon had prohibited buying from them. At present Israel's sources of natural gas are the Tethys Sea consortium, but its field is not large, and Egypt. Yesterday Olmert wrote to Gordon Brown, Chancellor to the U.K. Treasury, saying Israel would be glad to do business with British Gas. Sharon had opposed buying Gazan gas, on the grounds that Israeli money might wind up financing terrorism. One can only wait with bated breath for the new business opportunities which await Olmert, the peacemaker, when he gets his shot at the big prize: four years as prime minister. Before I ever heard the name Daniel Pipes, it was reported to me that he had mounted a campaign of slander against me. Until then, I didn't realize that not only was he a member of the Council On Foreign Relations (CFR), he was almost entirely funded by them directly or by proxy. His prominence was not due to any innate talent; he had an in. His father, Richard, was head of the CIA's Soviet department through the Cold War. Pipes turned to writing mediocrities with names you don't know like Goldwasser, Balint and Plout. Their assignment was to write to every site and newsgroup which published me, threatening them if they so continued. The first two, I surmise, saw how they were used and backed off. What remained was the third mediocrity, Plout. Now I never publish his name simply because he doesn't deserve any publicity on my coattails. Leave it be said that he is a professor, virtually unknown in Israeli academic circles, and he once wrote a book, apparently about the local boy scouts movement. I looked it up on Amazon. It is number over a million, meaning it's sold about twelve copies. Pipes tried to cover his tracks by setting up a phoney grudge between me and him. That didn't work because, if I had to, I would choose a much worthier grudge match. But he took on his assignment with vigor and not much intelligence. After being caught in the act with sites loyal to me, he played the same game using pseudonyms in places like Rotter.net and Israel's Wikipedia. But he was too dumb to cover his tracks well. His style of slander was repetitious enough but the big giveaway was referring to Pipes and leaving links to his site everywhere he showed up. The best giveaway though was, accidentally or not, now and then, thoughtfully including his e-mail address in the comments supposedly by other people. His most vicious slander was a longterm attempt to portray me as a Holocaust denier. For that I am suing him next week. In the Jewish Press article, to save himself in court, he admitted it wasn't true. But in the wake of it, he employed a few devotees with names like Efratguy to spread the same lie. Stay safe... looks like you're enemies are pretty desperate to shut you down. I couldn't believe it when they called you a neo-nazi and a holocaust denier! "Virtually every "question" raised by the conspiracists about the Rabin assassination has by now been fully explained away and answered:"
Only error and misdeeds have to be explained away, like trying to "explain away" lipstick on your shorts. It is surprising to me that the Jewish Press would support such weak quasi-intellectualism as was present in the conspiracy article by Steven Plaut. One can never judge the truth by just labelling something mental illness and writing it off like that. Every true Dayan (and scientist as well) understands that every detail of a claim must be examined carefully before a conclusion is reached as to its veracity or lack thereof. Next, the writers expressed the suspicion that the article was commissioned by people a great deal more powerful than the "author:"
Tell me, dear Mrs Klass, do you have any idea who could possibly have been paying whom to make fun of a very good and serious man called Barry Chamish and whose political fortunes are supposedly served by it? One wonders why the author of this article finds the official gov't line so much more credible than the obvious conclusion which the above facts lead to. One also wonders if he doesn't have similar biases in his poohpoohing other conspiracies, in particular the Rabin Assassination which he has written about extensively in defense of the gov't position. Plaut then quotes a certain "seminal book" by Daniel Pipes. The entire Plaut article thus strives to resemble a scholarly review of another scholarly work. This sort of writing just proves that he is either a mole or a tool of the Federal Government. The author then goes to the fallacy of logic (argument ad hominem) and links Barry Chamish to fringe neo-Nazi and Holocaust revisionist groups. I can attest, that as a conservative in some political aspects, nonetheless my writings have appeared in the web-pages of the far left in America. The fact of the Internet is, that anyone can cut and paste the writings of anyone else. So much for the spurious use of argument ad hominem by the individual to whom I address. Very simply put; Barry Chamish writes with a bias to Israeli nationalism and Daniel Pipes is a Neocon. There you have it. 1-Conspiracism is probably best characterized as a form of mental illness. Are you a licensed psychiatrist? 2-Some researchers in psychiatry plainly agree.....WHO? Vocabulary words used incorrectly by individuals who consider themselves intellectuals create misrepresentation, but what is even more bizarre is how loosely some individuals use non existent terms or words. There are many slick unsavory characters from all walks of life who probably contribute to numerous unsolved mysteries. There is no reference to "conspiracism" or "Conspiracists" in legal or medical terminology or any reference to a diagnosis of "conspiracism" as a mental illness or "plague". Conspiracy: in Criminal Law occurs when two or more persons conspire/ plan an unlawful act, which becomes unlawful when done by the concerted action of the conspirators. Civil Conspiracies: the term "civil" is used to designate a conspiracy which will furnish ground for a civil action,as where, in carrying out the design of the conspirators, overt acts are done causing legal damage, the person injured has a right of action. His faulty logic goes like this: Because some people believe in conspiracies, all people who believe in conspiracies suffer mental illness, and therefore promote anti-Semitism thus they are dangerous and you should avoid them. When I have questioned Plaut about his passion against Chamish, he was totally steadfast. No facts in the world could sway Plaut from his attitude. His answers were full of emotion. He did not answer my questions just lashed back about Chamish being crazy. As I see it, Plaut has a personal dislike for Chamish and the Jewish Press fell prey to it. If it is not a personal dislike, it is probably part of a campaign to discredit Chamish so the truths he does discover are not given validity. I guess that would make it a conspiracy, and since I am the one to suspect it, by Plaut's definition that would make me mentally ill.
Daniel Pipes may be an 'expert' on the Middle East but it is news to me that he is also a serious student of psychology. To describe all those who come to grips with some of the most serious conspiracies - and their cover-ups - as paranoid delusions, - means that a huge percentage of Israel needs to be in the padded cell recommended by this supposed academic. At risk of being called a conspirator by Plaut, and therefore mentally ill by his definition, I question why Plaut is so vehemently opposed to Chamish's work that he would spend so much time and effort to discredit him. Conspiracy theories are like Chassidishe Maises (miraculous stories of Tzaddikim) If you believe all of them you're a fool, if you don’t believe any you’re in denial!!! Now look at this remarkable exchange, sent to me. The reader merely suggested that Plout appear on Tamar Yonah's radio show on Arutz Sheva to explain his views, because she often has me as his guest. What is Plout's answer? He calls Tamar "mentally ill."
I asked Plaut if he'd be prepared to be interviewed on Tamar Yona's show. This was his reply!! I do not debate with the mentally ill. In his defense petition to the court at the upcoming suit, plout submitted reams and reams and reams of quotes from my work. He knows every word and nuance of my writing. In fact, he knows it far better than I do. I certainly never read anything he's "written," so if he doesn't like my stuff, why doesn't he just ignore it? What is the reason for this obsession. As you will soon see, many readers assume he is on Pipes' payroll and just wants to impress the boss. That answer is not entirely satisfactory to me. He attacks his mission with way too much vigor. Can you imagine anyone working day and night, non-stop, just to put an end to my writing success? There have to be more sinister causes. Now we have to ask ourselves why Steven Plaut feels compelled to write missives containing such bitter vitriol? In a google search for Mr. Plaut's writings I discovered that nearly everything he writes is a tirade or a screed. His articles almost without exception are written in the attack mode. He reminds me of a two year old screaming to get his demands met. It is obvious to me that Mr. Plaut is crying out for help. He has an identical psychological profile as the inmates whom I counsel in the state prison system. He appears to be unbalanced. He needs to get help soon. We are clearly dealing with one very sick individual. I just wrote to the Letters to the Editor. I've heard nothing back. A situation has developed in The Jewish Press where serializing Barry's essays has been replaced by serializing non-stop, primitive attacks against Barry, WITH NO RIGHT OF RESPONSE. And I say that it is not right as a journalist who has been a member of the U.S. Society of Professional Journalists for 16 years, a member of the Foreign Press Association in Israel for 15 years, who produced a nationally syndicated radio show in New York (The Barry Farber Show), was a Business and Finance Reporter with Reuters' second largest bureau worldwide, in New York, and worked with CBS Television National Network News, in New York. You cannot maintain the pretense of The Jewish Press being a serious newspaper -- unless you simply want to be seen as another Shtetl Jewish organizational rag -- if you go on and on and on publishing these Trash Barry Chamish "commentaries" and "letters-to-the-editor", NEVER allowing your victim a right of response. A group of Orthodox Jews would be the last group I would expect to go along with smearing another person as you allowed to happen in your paper. Using the Laws of Evidence as a standard, do you excuse yourself because you are not acting in a court. Well, you are acting in the court of public opinion. Perhaps you also ignore the possibility that what you printed was loshen hora. Decency on your part would have posted the opposing opinions next to each other and let the reader come to his own conclusion. If this article did not come 'covered in money' then a modicum of research on your part would have shown the entire thrust of the article to be completely invalid. If it did come 'covered in money' then you should have prominently displayed the 'sponsor'. I won't be hitting your website ever again, and I will be asking my friends and family to find their Israel and Jewish news elsewhere. Unless, of course, you'd like to apologize to Barry Chamish IN PRINT. I am utterly outraged. I plan to post my opinion about this all over the web (see the Weekly Thought in the blogspot of Solongroup.org). You have no idea how large a sector of society you are offending. Take that into consideration at your next board meeting. The Jewish Press should be ashamed to allow this kind of vulgar slander to appear on its pages. I have an appeal. I took the article to my attorney Dov Even Or and he advised me that it was amongst the most blatant and libelous hatchet jobs he's ever seen. But a suit from Israel would bankrupt me even before it was heard. I can afford to sue a plout from here but can't reach the jewish press without a New York based-attorney. If anyone can represent me on contingency, we have an easy victory and a great way to get Israel's anguish publicized. Please write me if you can take on a trial for justice...that will pay for itself. The Vatican rolls on. My new DVD Zion First: The Vatican's New Crusade For Israel becomes more relevant by the day. How much so? 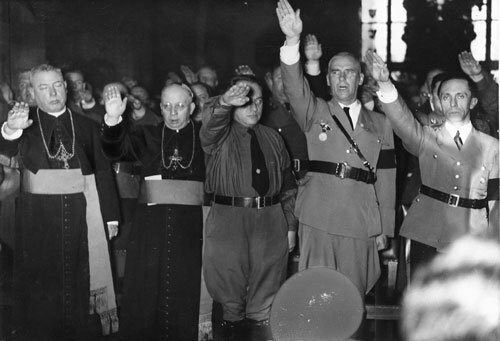 Under separate cover, I am sending you a photo of the pope in his happy youth standing beside the butcher Mengele. (IsraelNN.com) The non-profit Jerusalem Institute for Israel Studies has issued a study recommending that Jerusalem's holy sites be administered by an international body. The study likely will be presented at the annual Herzliya conference schedule to start this Saturday. The center's research concluded that the "lack of trust between Israel and the Palestinian Authority" supports turning the authority over to an international committee to preserve holy sites. Jordan closed off non-Moslem sites during its occupation of the eastern part of the city. Israel re-opened up Christian and Jewish sites to visitors after Jordan retreated during the Six-Day War in 1967 and Israel reunited the capital.